Charlotte Tilbury launches the Beauty Filters Collection! A filter palette to morph your eyes into their biggest, brightest, most sparkling eyes ever. Inspired by the sparkling, eye-widening filters of social media, this palette is colour curated and coded to make your eyes look instantly bigger and brighter, as well as putting what Charlotte famously calls the ‘lights-into-the-eyes.’ Charlotte has de-codified the application into an easy PRIME, ENLARGE, DEFINE and POP sequence, with each micro-finely pigmented shadow colour-formulated to give the optical illusion of widening, brightening and playing with the light in specific areas after application. Prime – A warm, eye-brightening ivory-cream which reflects light and gives the effect of broadening the whole eye area. When this technique is applied to the inner corners of the eye, it eye-widens! Enlarge – This lightly contouring, rose-gold shade gives a lifting effect to the socket, and can be built up or washed across the eye lightly depending on the radius of the eye. Define – A defining, colour-contrasting universal reddish-brown that adds instant definition to the lash-line and makes the eyes look brighter. Pop – A wash of transparent sparkle that can be used in targeted areas with a technique that will eye-widen and eye-brighten throughout the day. Prime – This soft champagne gold helps to elongate and prime the eyelids making them look wider and fresher. You can pop it into the inner corners to give the appearance of wider, brighter eyes. Enlarge – This enhancing copper-gold can be used to contour the outer socket. It light-reflects to lift the look of the eye. Define – This is a highly pigmented, dark chocolate defining and brightening shade to be used along the lash-line, and lift the look of the eye! Pop – This deep brick red colour-contrasts with most eye-colours, adding vividness to the iris like a filter does. Charlotte calls it ‘lights-in-the-eyes. 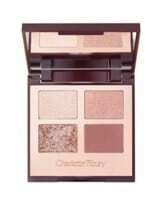 Bigger Brighter Eyes (Limited Edition) available for £39 from www.charlottetilbury.com and Charlotte Tilbury stores now! Join the Charlotte Tilbury Pro Artist Program! An exclusive Pro Programme for professional makeup artists and makeup students! Complete with a number of unique benefits, including a 30% discount across most beauty products, unique giveaways, events and new product previews! All applications are through www.charlottetilbury.com. To become a member of Charlotte Tilbury Pro, email pro.applications@charlottetilbury.com under the PRO section. Artists are required to submit documentation outlined in T&C’s, plus the following details: First name, Last name, Email address, Date of birth, Mobile number, Country of residence, Professional website & Instagram handle.